Fig. 3-20. 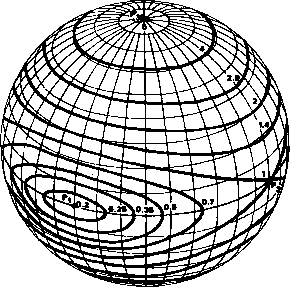 Spheres of Influence About the Moon for <=0.01. In Region 1, orbits are approximately Keplerian about the Moon; in Region III, they are approximately Keplerian about the Earth. where /t = m/M<£.\, S is the separation between m and M, and <<1 is the ratio of the perturbing force to the central force. Values of Ax and R2 for the various Sun-planet systems for c=0.01 are given in Table 3-6. 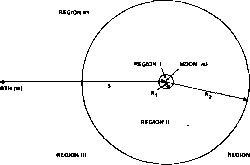 For the Earth-Moon system, the radii about the Moon for <=0.01 are /?,= 14,900 km and R2 = 189,000 km, as shown in Fig. 3-20.